Thats been around for at least six months…but its still funny as hell!!! That is pretty funny, all right. Those kind of jokes are the best. 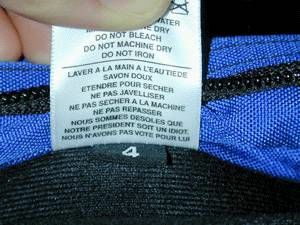 It’s even better that it’s written in French. even funnier…”See Tom Bihn Bags in Iraq, Afghanistan, Antarctica, Australia, and Italy”…link from their site!! Jim Hood sent us this note along with these cool pictures!